Best-selling suspense novelist Mary Higgins Clark invites you on a tour of Manhattan's most iconic neighborhoods in this anthology of all-new stories from the Mystery Writers of America. 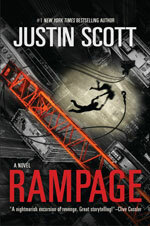 "...There were three that definitely grabbed me more than the others: Evermore by Justin Scott (this my favorite), Copycats by N.J. Ayres, and last but not least, The Baker of Bleecker Street by Jeffery Deaver..."
"...But particularly enjoyed Justin Scott's take on a mystery with the element of time travel. A modern day bank robber ends up partnered with the very alive Edgar Allan Poe who is having trouble publishing a best seller in today's market that will make him eligible to win the award that bears his name. It's a fast paced shoot 'em up full of ironic commentary on what authors have to deal with & Poe gets all the best lines ("Do not expect me to be frightened by an armed robber. 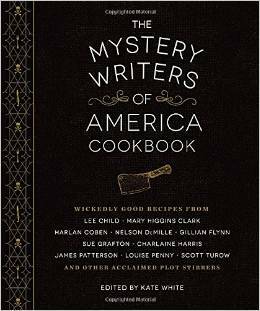 I'm accustomed to agents & publishers..."
The Mystery Writers of America is launching the MWA Cookbook, edited by Kate White. 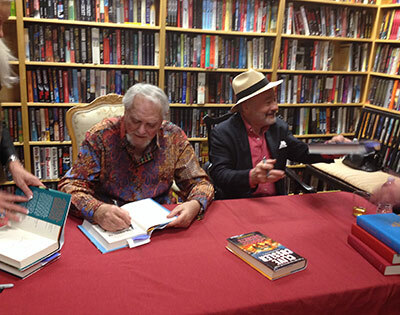 Justin Scott and Clive Cussler signed 1000 books and answered questions for a live audience at Poisoned Pen Bookstore and for people we streamed to on line. Isaac Bell launched his Facebook and Twitter pages. 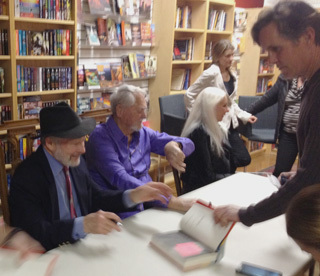 March 5, 2014 Justin Scott and Clive Cussler signing the just-published The Bootlegger at the Poisoned Pen Bookstore in Scottsdale for a long, long line of Isaac Bell readers who tend to be as friendly as they are lively. The annual ritual is bracketed by Cussler and Scott pounding away at the new Bell in Cussler's Arizona office. The Cutthroat by Clive Cussler and Justin Scott is #1 New York Times Best Seller List April 2, 2017. Rampage will come out in Hardcover and E-Book format on May 9th 2017. 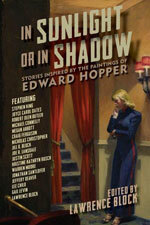 A Woman in the Sun by Justin Scott in a short story anthology based on paintings by Edward Hopper In Sunlight or in Shadow. "... Best anthology theme I ever heard, was my immediate reaction when Lawrence Block told me his idea for a collection of short stories inspired by Edward Hopper paintings. Hopper paintings are stories—better yet, they pose the beginning of a story, or the end, and sometimes both. Larry even had a terrific title—In Sunlight or in Shadow—and a bold publisher willing to reproduce the paintings in full color. I made it clear I would be delighted for a chance to contribute. (Having inspired me to start writing, many decades ago, the poor devil had little choice but to invite me.) It turned out to be the most interesting writing job. I chose “A Woman In The Sun,” a full length portrait of a naked lady in a beach house. I studied it for many days, repeatedly, as I would when writing an historical novel in order to absorb the common details recorded in a hundred year old photograph. 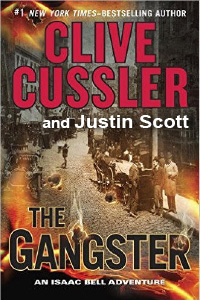 All of a sudden, I thought I saw where she was going...."
"...Clive Cussler and Justin Scott bring 1906 to life in vivid technicolor descriptions in THE GANGSTER. Detective Isaac Bell, star employee of the Van Dorn Agency, is charged with..."
Isaac Bell is back in a thrilling new adventure — the ninth in his series. "...New York City, 1906. The Black Hand, a criminal syndicate composed largely of Italian immigrants, has the city in a tight grip of fear. Isaac Bell, of the Van Dorn Agency, is tasked with putting a stop to their crimes (which include, but are not limited to, extortion and kidnapping). But Bell soon begins to wonder: Is the Black Hand a cover for a darker, more subtle form of crime? A series of murders—the victims are all highly placed in society—leads Bell to the shocking truth. As usual, this latest Bell thriller combines a vivid historical environment with a top-notch story and enjoyable, realistic characters. 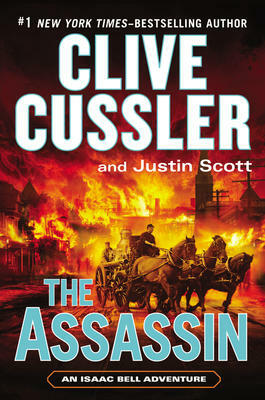 Bell, the detective whose nimble intellect often gets him out of tight situations, is one of Cussler’s most engaging protagonists . . . and the Isaac Bell novels lead the way in terms of quality..."
The Assassin came out in paperback March 1, 2016. 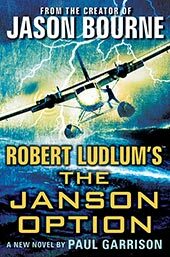 The LOS ANGELES TIMES called The Man Who Loved The Normandie (originally published in the USA in 1981 as "Normandie Triangle") "A big ... brilliantly plotted novel of World War II espionage." Kindle eBook is now available on Amazon. 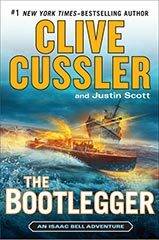 The Bootlegger by Clive Cussler and Justin Scott published in paperback on March 3, 2015. 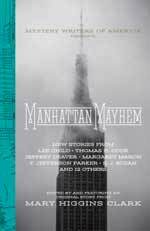 The short story Evermore by Justin Scott was published June 2, 2015 in an anthology Manhattan Mayhem, edited by Mary Higgins Clark, celebrating the Mystery Writers of America's 70th anniversary. 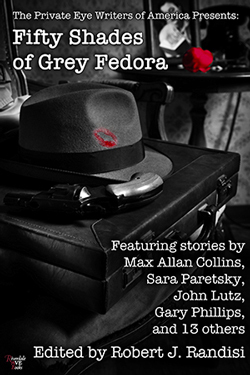 The short story Take Off Your Clothes by Justin Scott was published in the Private Eye Writers of American anthology, called Fifty Shades of Grey Fedora, and edited by Bob Randisi. The Janson Option comes out in paperback on September 30, 2014. The Empty Eye of the Sea appeared originally in the UK in 1993. 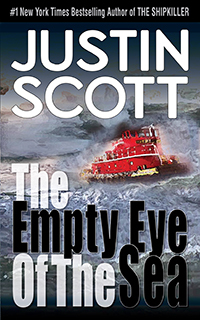 Kindle eBook version of The Empty Eye of the Sea was published on Amazon in July 2014. Now eBook is available in iBooks store. 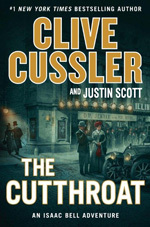 The Bootlegger by Clive Cussler and Justin Scott published on the March 4th, 2014. 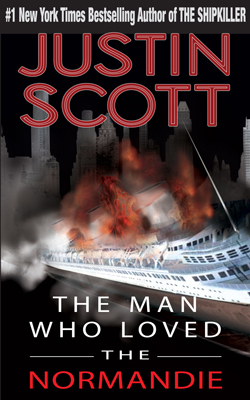 The Bootlegger debuted on the March 23rd, 2014 New York Times Bestseller list at Number Two.